Graeme Campbell joined Hayfield Manor Hotel in 2006, a member of the Small Luxury Hotels of the World, after honing his career in Ireland, Scotland, and Great Britain, at Lyrath Estate Hotel in Kilkenny, Berthouse Country House in Kildare, Merrion Hotel in Dublin, The Savoy in London, Hilton International in Glasgow, and Kensington Park Thistle Hotel in London. 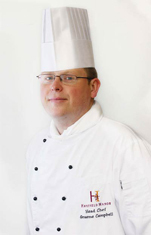 I stayed at Hayfield Manor Hotel in September 2007, and had the opportunity to experience Head Chef Graeme Campbell's cuisine at both of the hotel's restaurants, Orchids Restaurant and Perrots. Chef Graeme Campbell shares his recipes for Crisp Fried Calamari Arrabiatta and Asparagus and Gorgonzola Crisp Bread. Calamari Method: Place the calamari in an airtight container, and then add oil, spring onions, turmeric, and garlic. Mix thoroughly and leave in the refrigerator for 24 hours. Remove calamari from the marinade and lightly shake off any excess oil. Place in bowl with enough milk in it to cover the calamari. Then drain off the milk. Place on a flat tray and cover with plenty of flour. Lightly toss the calamari in the flour. Heat oil in a frying pan or deep fryer at 170° C (338° F). Sprinkle calamari into hot oil, making sure that all excess flour is shaken off. Fry for about 1 minute or until the calamari is crispy. Remove from the oil and place on a dry cloth. Sprinkle with salt. Sauce Method: Lightly cook onions in hot vegetable oil. Add garlic and cook for 30 seconds, stirring frequently. Add chopped tomatoes, and slowly cook for 10 minutes. Pour in chicken stock and add chopped chilies and allow to cook slowly over low heat. Stir occasionally until the chicken stock has evaporated. Add salt and pepper and a little sweet chili sauce to your personal taste. If you like it hotter, just add more chilies. 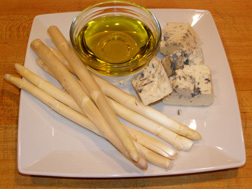 Method: Cut asparagus approximately 4-inches in length with a small knife removing any rough shoots up to just below the tip. Cut a piece of flavored bread into a diamond shape slightly longer than the asparagus. Brush the bread with melted butter and place on a baking tray and cook for about 15-20 minutes at 160° C (320° F) or until crispy. Keep warm. Place a pan of water on the stove with 1-teaspoon salt. Bring water to a boil. Place asparagus in the boiling water and simmer for approximately 2 minutes. Drain the asparagus in a sieve. Place pan back on the stove with a knob of butter and let it melt. Put the asparagus back in and season with salt and pepper. Switch off the heat and let rest for a minute. Place bread on serving plate and drizzle with olive oil. Place 6 asparagus spears on the bread and crumble the Gorgonzola on top and place in the oven, until the cheese begins to melt. Cut and Serve. "This dish is perfect for a light starter or nibble with friends. All can be prepared in advance and put back in the oven for 5 minutes when needed so that you can enjoy your time instead of slaving in the kitchen." - Chef Graeme Campbell. Please read other articles on Hayfield Manor Hotel in the Hotels and Resorts section, and about their restaurants, Orchids Restaurant and Perrots Garden Bistro, in the Restaurants section. Please read other articles on Ireland in the Destination - County Clare and County Kerry, Ireland, Destinations, Hotels and Resorts, Restaurants, Chefs' Recipes, Spas, Liquor Cabinet: Celtic Crossing Liqueur, Boru Vodka, Knappogue Castle Irish Whiskey, Fashion, and Adventures sections.